City: 15 – Hwy: 24	Actual rating will vary with options, driving conditions, habits and vehicle condition. Callaway Cars got off the ground in the garage of founder Reeves Callaway—whose father launched the Callaway vineyard and, later, Callaway Golf—where he was building turbo kits for the BMW 320i in the mid-1970s. But ever since its sanctioned-by-GM, twin-turbo C4 Corvette launched to great acclaim in 1987, the company has mostly stuck with modifying Chevy’s sports car. The Z06 Carbon was created to celebrate the 50th anniversary of the first appearance of the Corvette at the 24 Hours of Le Mans when John Fitch and Briggs Cunningham won their class and finished eighth overall. 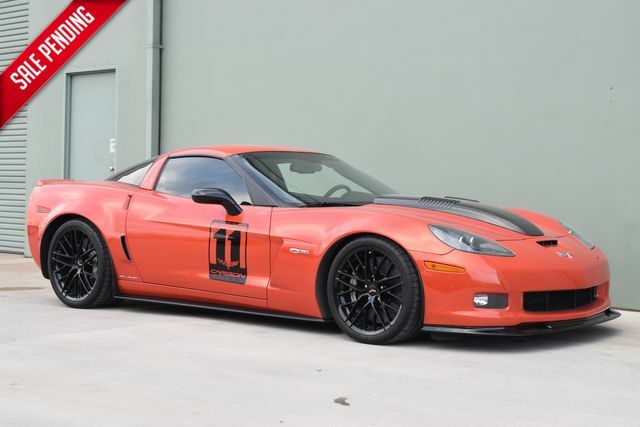 The Carbon edition is essentially a Z06 with a ZR1 chassis and some of the carbon skin. With only 500 examples were made and only came in two colors, Inferno Orange and Supersonic Blue. All examples get black-painted wheels and a black interior upholstered in leather and suede. THIS INFERNO ORANGE IS ONLY 1 OF 85 BUILT IN INFERNO ORANGE!!! One element unique to the Z06 Carbon is its hood. The profile of the new carbon fiber hood is identical to that on the ZR1 but without a transparent window. That makes it the lightest hood ever on a Corvette and, according to chief engineer Tadge Juechter, it truly is a featherweight. The splitter, rocker extensions and roof of the Carbon are painted black instead of the super-expensive clear-coat used on the ZR1. The headlamp pockets and wheels are also painted a glossy black giving the Carbon a decidedly sinister appearance. This limited edition Z06 boasts Brembo carbon ceramic brakes with specific dark gray metallic calipers. These powerful brakes were first introduced on the ZR1. Black 20-spoke 19-inch front/20-inch rear wheels complement the car’s Michelin PS2 tires. Other mechanical features include Magnetic Selective Ride Control for the first time on the Z06 and enhanced cooling. The Z06 Carbon’s ebony leather and suede interior is complemented by orange seat stitching to match the exterior color chosen. Other features include a unique steering wheel emblem, sill plate and logoed headrest. The suede used on the steering wheel, shifter, seat inserts, armrests and doors add to the luxury of this limited edition Z06.